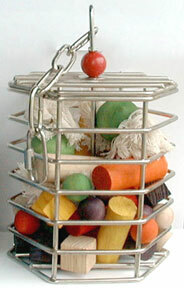 Your SS nut cage arrives EMPTY (we filled a large basket, photo on top, with the large refill so you'd get an idea of what it looks like) but you can fill it up with whatever you have handy or order one of the refill packages (pictured above) along with your cage! 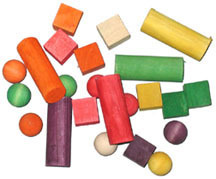 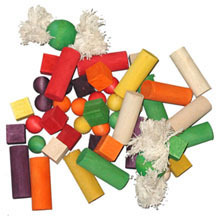 This is the perfect way to recycle "pre-chewed" pieces or put a roll of adding machine paper or bagels, whole nuts, ABC blocks or pine cubes, craft sticks, vine rings, clothespins, ParroTraps, whiffle balls, spools from thread, munch balls (check out the MYOT section for other options to include in your cage) are just a few inexpensive ways to refill the basket! 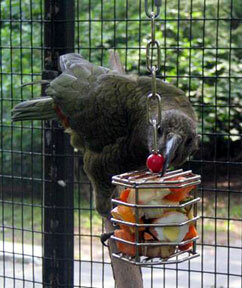 A Kea (at the Franklin Park Zoo/Zoo New England, Boston, MA) photographed top left, gets his small stainless steel nut cage filled with carrots, hard boiled eggs, oranges, apples, and other food stuff to encourage foraging. 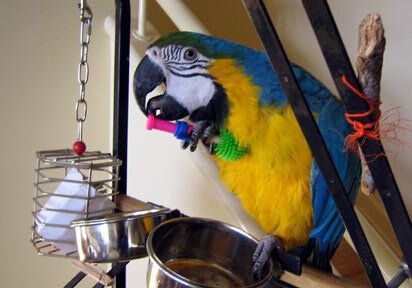 The B&G Macaw, Jazzi, photographed top right gets left over goodies put in the nut cage like wooden pieces broken off of other toys that still have chewing life, some bamboo, cardboard ... great place for recycling those pre-chewed toy parts! 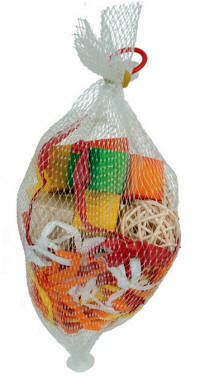 Add an ear of corn or a couple cup cakes to add some "healthy" variety to this recycling toy!